back to that blank, volcanic, deadpan face. 1. 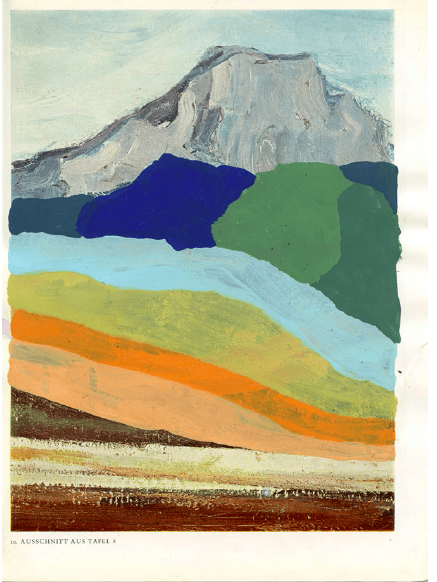 Georgia O’Keefe painted Cerro Pedernal over thirty times from her studio at Ghost Ranch. If she painted that mountain enough times, she thought, God just might give it to her. 2. Doing something thirty times over indicates a certain amount of affection. O’Keefe’s husband, the photographer Alfred Stieglitz, photographed his wife over five hundred times. 3. I must have first seen you out the plane window at twenty-two. Perhaps this is why whenever I fly I always take the window seat. Now that Seattle is home, every arrival and departure means a chance to see your face. 5. It’s hard to describe what mountains mean to a plains girl who spent the first two decades of her life confronting an uninterrupted horizon. Sunrise to sunset. Mountains often fill voids other than the sky. 7. When he read his friend Émile Zola’s novel L’Œuvre, Cézanne recognized himself in the central character, a painter called Lantier. 8. The first image in Katsushika Hokusai’s series Thirty-Six Views of Mount Fuji is The Great Wave off Kanagawa. In the print, the wave almost eclipses the mountain, which can be seen beneath the hungry curl of its crest, standing snowcapped and small in the distance. The sea rages and, being in the foreground, is the clear, present danger, yet the mountain in the background cannot be underestimated. It’s diminished, yes, but isn’t this just a matter of perspective, and isn’t perspective what is needed to remember that Mount Fuji has been standing there all along, that when the wave melts back to sea – taking whatever inland destruction it wreaked with it – the mountain will continue to stand? Looking at Fuji untouched by the wave’s fury, you get the sense that, if it wanted to, it could blow its top, but, at this particular moment, it has chosen not to. It is the mountain’s presence that most inspires when viewing Hokusai’s thirty-six prints. Rain or shine, snow or wind, clear skies – seen from village, sea, or city – the mountain is a timeline against which all of life is measured. 9. At a national park’s visitor center, I view a miniature diorama that reveals the Pacific Northwest before European settlers arrived. “Mount Rainier as it appeared to native inhabitants,” explains a nearby plaque. At this point I’ve lived in Seattle for a few years, so I’m accustomed to seeing you couched between skyscrapers and the Space Needle, or crowded up against a Ferris wheel. That is, you’ve always appeared in the context of architecture which, magnified in the foreground, serves to shrink your sheer size down to something that can be swallowed in day-to-day bites. In the diorama, all of this is stripped bare. You rise from the plains like the god which those who saw you unspoiled believed you were – the god, perhaps, you are. 10. A less-known fact about Hokusai: he was one of the nineteenth century’s leading designers of three-dimensional dioramas. 11. “I like being able to see what’s coming; it’s a kind of security,” a friend who has chosen to stay in the Midwest explains. And it’s true: when you live in the midst of plains you have the advantage of always seeing what’s on the future’s horizon – a cyclone perhaps, funneling across farmland. But when you live in the daily presence of a volcanic cone, when you walk upon soil whose properties imply the presence of lava flows, it’s a constant acknowledgment of what has been, and what in all likelihood will happen again. It’s the difference, perhaps, between living in anticipation and living with acceptance. Between fleeing below ground and bowing one’s head. 12. I’m still trying to forgive the woman in the middle seat who, as the plane banked for descent, reached across to plaster her oversized cell phone against my window. We sat silently watching you sink pink beneath the clouds on her screen. Until my offended muteness melted into her wordless awe. 13. Mount Fuji’s northwest flank is blanketed by Aokigahara Forest, a thick wood that has grown up over lava that once flowed molten from the mountain’s core during an eruption in 864. Over hundreds of years the cooling lava was sown with seeds dropped from the beaks of passing birds. Today the forest has become so dense it is known locally as Jukai, or the “Sea of Trees.” Beneath a canopy of cypress and hemlock, warped roots furred with moss twist across a forest floor of volcanic rock so porous it absorbs sound, lending Aokigahara-Jukai its reputation for silent beauty. 14. The Iowa landscape is cultivated and purposeful. Cornfields do not have to explain their usefulness or excuse their ample existence. 15. Living in the shadow of a mountain after college was a luxury, even, perhaps, a bit of a rebellion. What was I rebelling against? Unchanging scenery, for one thing. “Treadmill runs,” my sister used to call jogs along the miles of gravel road that hem Iowa’s cornfields like patchwork. Perhaps even against the pencil-straight rows of purposefully planted corn. Against the idea that burying a kernel yielded a predictable crop. The skies pressed down against a two-dimensional landscape. I boarded a plane and rose above them. 16. “His horizons are high, his blues very intense, and the red in his work has an astounding vibrancy,” wrote Gauguin of Cézanne. 17. When I first moved to Seattle, I was prone to car accidents. Driving over the Aurora Bridge, high above the ship canal, I would sneak glances left and right: east to the Cascades, glowing at sunrise, and west to the jagged peaks of the Olympics, dark silhouettes at sunset. This was actually safer than gazing straight ahead, where, on a sunny day, you might dazzle me right off the bridge. 18. Seattle’s Aurora Bridge has been the site of over two hundred and thirty suicides, trailing only San Francisco’s Golden Gate. Which side do the jumpers face? East to the Cascades or to the Olympics in the west? Sunrise or sunset? 19. Mount Fuji’s soundless “Sea of Trees” is also known as “Suicide Forest” and is the country’s most notorious place to take one’s life, with around one hundred suicides documented a year on this side of the mountain. 20. One of Hokusai’s illustrations of the Japanese epic Strange Tales of the Crescent Moon depicts the ritual suicide of Takama Isohagi, the servant of a medieval warrior. The image reveals two moments simultaneously: the moment when Isohagi plunges the sword into his stomach and the moment after, when he lies prone in death. Cresting over the raised heap of the two bodies, a wave seems a moment away from washing the scene clean. In retrospect, with Hokusai’s later works in view, it’s easy to read this early illustration as a precursor of what would become The Great Wave. In Takama Isohagi, the wave’s foaming crest hangs just over the focal point of the print: the composite of Isohagi’s body bent back over his corpse at the moment of death. Thrown together, the bodies, above which the suicide’s determined chin thrusts in a peak of anguish, form the unmistakable shape of a mountain. The difference between the prints is of course what happens next – that is, what remains. Another way of looking at it: The suicide becomes the mountain. 21. When I move back to Seattle with my husband, ten years after first glimpsing your face, our kitchen window offers a view of your peak, which only appears above the pines on certain days. This elusiveness, the ability to disappear, even on seemingly clear days, by some trick of the atmosphere, is nothing short of seduction. As when, after a period of several days without a sighting, you stand there reflecting a late afternoon sun off a blinding white slope, or revealing a bit of blueish rock that snow cover once concealed, or emitting the soft pink aura of a sunset before melting into the crepuscular sky, until it is as if you were never there at all. Every day you are different; every day you are the same. And even when I can’t see you, I know you are there. Even when you are there, I can hardly believe it. But months go by without my picking up so much as a carabiner. 23. Then, on another day, I sit down at my desk and begin to write about you. 24. In 1870, Hazard Stevens made the first successful documented ascent of Mount Rainier, along with Philemon B. Van Trump. With such rich names as these, it’s hard to imagine why we stuck with Rear Admiral Peter’s surname, just because Vancouver’s expedition spotted the peak from the Puget Sound (which they also named). Of course, the native inhabitants knew you by several names already: Tacoma (“snowy mountain”), Talol (“mother of waters”), and Ti’Swaq (“sky wiper”), among others. Words that lay claim by describing what is there. 25. Throughout his life, Hokusai changed his name at least thirty times. This happened so frequently, and the new names were so closely related to shifts in his artistic techniques, that critics have found them useful when referring to his work from specific periods. Perhaps it was this fluidity of self that contributed to Hokusai’s drastic shifts in perspective, and which allowed him to know the same entity from several angles, through many seasons, shades, and lenses, to understand the nuances of light and shadow across a face, how the very textures and especially colors could change in the space of hours. The self, Hokusai’s Thirty-Six Views seems to say, is always essentially there, yet identity is not immune to context and conditions, rather the environment, as well as the position of the viewer, might drastically change how one is presented and perceived by the world. 26. For much of Japan’s history, suicide was viewed as an honorable act, as established through the tradition of seppuku, the ritual suicide of samurai to avoid defeat or dishonor, later manifested during WWII in the kamikaze pilots who flew their planes into the enemy as an act of ultimate self-sacrifice. This cultural tolerance for self-obliteration might also be attributed to amae, or the need to be accepted by others. In Japan, conformity – belonging to the whole – is traditionally valued above individuality. From this perspective, one’s worth becomes less defined by individual accomplishments and more highly correlated with how one is perceived by others. I point this out to say: choosing where one lives can sometimes be a matter of life and death. Or, at least, it can feel as if one is choosing between life and a kind of death. 27. It’s not that I am looking to own you, exactly. Especially not exclusively. I’m not planting any flags. When a person claims a landmark, it’s not so much a statement of ownership, but a bid for belonging. At least, that’s the way it feels: the mountain exerts a power over me, not the other way around. So that when we say this is my place, what we are actually saying is I belong here. 31. Hokusai’s father, Nakajima Issai, was a mirror maker. Who can tell, perhaps the mountain acted as a looking glass for Hokusai, one in which he saw his fluid, everchanging soul reflected. In that case we might read his thirty-six depictions of Mount Fuji as a series of self-portraits. 32. When I leave Seattle for graduate school a few years after first arriving, I don’t think much about the ways I have changed since leaving Iowa. But when I move back to the city a decade later, I find that I can measure the years and their changes against the backdrop of who I was when I first encountered that mountain. 34. It’s clear, of course, why Hokusai would, at the zenith of his career, choose Mount Fuji as a subject. The mountain stands at the center of Japanese identity, rooted in a cultural belief that goes back to the ancient Tale of the Bamboo Cutter, in which a goddess deposits the elixir of everlasting life at the summit. The etymology of the name Fuji can be traced to the folk word Fu-shi, which translates as “not death,” in other words, eternally alive. 36. 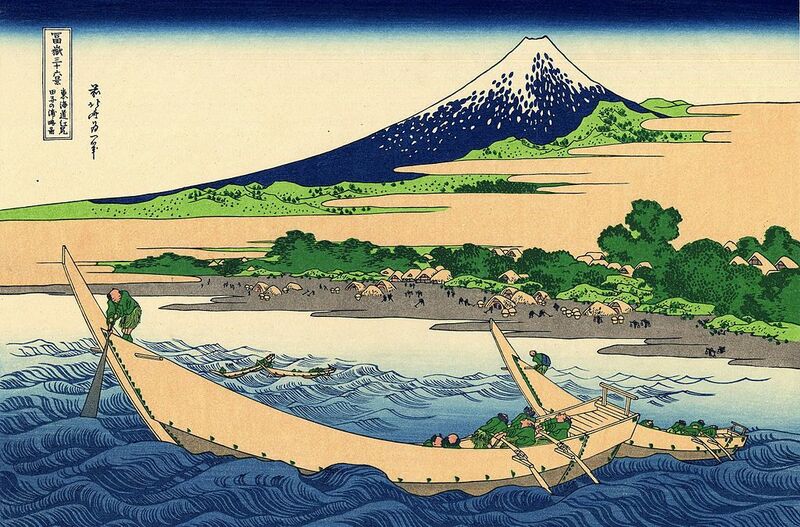 What is less clear is why Hokusai chose to depict thirty-six views. Not thirty-five or thirty-seven; he didn’t even push for a nice round fifty, nor could he control himself at an even thirty. I like to think that thirty-five was just not enough. Or perhaps it was a matter of humility. The mountain enjoys a 360-degree view; to assume the human scope is ten times less seems like a safe bet. Any more might be presumptuous. And then there’s the possibility of the artist’s paradox: in restriction one finds the greatest freedom. Or maybe, according to his own prophecy, Hokusai feared that if he reached one hundred thirty, one hundred forty, or more impressions, his images might become alive – or, at least, wake up. No mortal wants to wake a mountain. Besides, surely by thirty-six Hokusai had already earned the right to sip at the mountain’s alleged elixir. Or, if O’Keefe’s theory holds, perhaps by the time he’d printed that peak thirty-six times, Hokusai felt the mountain was his. 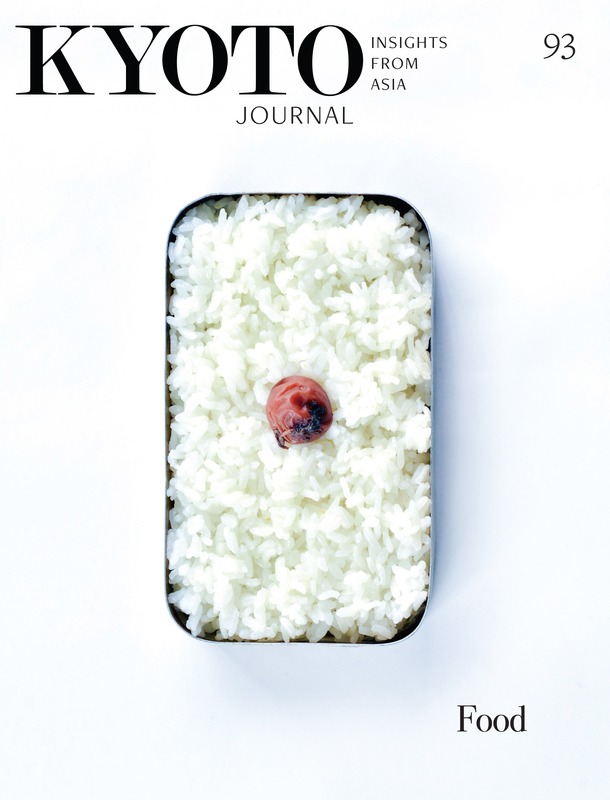 Thirty-Six Times was first published in Issue 16 of the Berlin-based, English literary publication: SAND JOURNAL (www.sandjournal.com), and Home is Elsewhere, the anthology of the 2017 Berlin Writing Prize, where the piece was awarded the runner-up. Print: Shore of Tago Bay, Ejiri at Tokaido from the Thirty Six Views of Mt. Fuji series by Katsushika Hokusai. Wikimedia Commons image.